Reincarnation is the rebirth of the soul. It is believed that the biological death does not destroy the soul, the soul comes back to earth in a different form, in a different body. Many religions believe that reincarnation has been happening since the beginning of history and has recently gained interest in both culture and scientific research. Roughly a quarter of Americans believe in reincarnation according to a 2012 Pew Research report, and there are thousands of case studies on reincarnation stories from around the world. 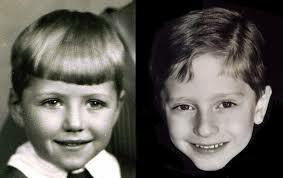 James was born to Andrea and Bruce Leininger, a highly educated and modern couple. From an early age, James loved to play with planes. From the age of two, James began having nightmares about planes and he would wake up screaming,”Airplane crash, on fire, little man can’t get out”. Once his mother Andrea bought him a toy plane and pointed out what appeared to be a bomb on its underside. She says James corrected her and told her it was a drop tank. “I’d never heard of a drop tank,” she said. “I didn’t know what a drop tank was.” Andrea’s mother suggested that James probably was remembering his past life. The couple took him to a counselor and therapist Carol Bowman, who believed that the dead sometimes can be reborn. With guidance from Bowman, they began to encourage James to share his memories. James was able to share more details about his past life with his parents, such as the name of the pilot, James M. Huston Jr.; the Navy ship on which he served, the Natoma; his co-pilot’s name; and the fact that he was shot down at Iwo Jima. Bruce was able to track down the co-pilot Jack Larson and Houston’s living sister. James told them many things from his past life which no one would ever know. There was no reason than for his family and Houston’s sister not to believe him. They believe that James Leininger had a past life Lt James Houston Jr, a man who died in Iwo Jima in 1945 and he had come back to finish something. Shanti Devi was born in 1926 in Delhi, India. In the 1930s, the little girl started remembering her past life. She began telling her parents at the age of four that this was not her real home. She told them that she had a husband and a son in Mathura and she wanted to go to them. Shanti Devi told her school teachers the same. One of the teachers then wrote a letter to the address given by Shanti Devi to inquire about the same. To everyone’s surprise, they got a reply from Shanti Devi’s previous husband, saying that his young wife Lugdi Devi had passed away a few years ago after giving birth to their son. The details Shanti Devi gave were all true. The case was then brought to the attention Of Mahatma Gandhi, who set up a commission for investigation. Shanti Devi took the researchers to her previous home and gave them the exact description of how her house and neighborhood looked before. She recognized her husband Kedarnath, her sister, and son. She told him details of their married life which made Kedarnath believe that she was indeed Lugdi Devi, born again. 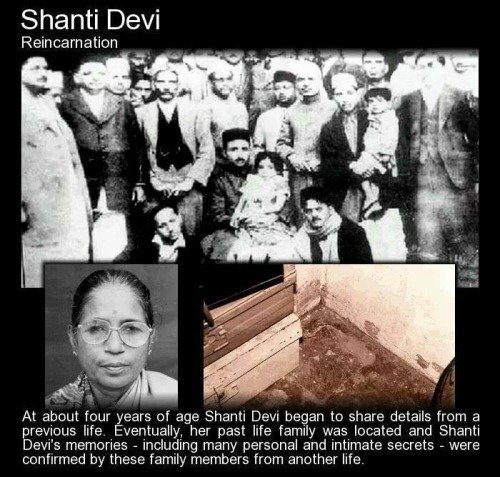 Shanti Devi also recognized her family members. She gave correct information about her family members which no one outside the family would have ever known. The commission’s report stated that Shanti Devi was the reincarnation of Lugdi Devi.